The story about the Bouddha Stupa is important, and it is incredibly inspiring. Hearing it, you will really understand the benefits of circumambulating it, cleaning it, and sweeping it the whole day and night. The stupa was built by a mother, Jadzima, who looked after her chickens. They were an extremely poor family, I think. She wanted to build a stupa very, very much, so she asked the king of Nepal for permission to get the land. Normally, the king wouldn’t give such permission, but somehow, maybe due to her karma, the king said, “Okay, it can be done.” This just slipped out of his mouth. This is why the Tibetans call it “Jarung Kashor Chörten.” Jarung is “it can be done,” and kashor is “slipped out of the mouth.” That’s the name of the Bouddhanath Stupa. Chörten means stupa. It’s also called wish-fulfilling. Why? 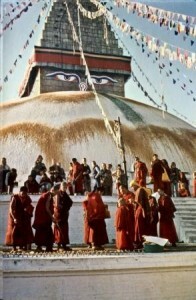 Because it is so powerful that the wishes of anybody who makes prayers to the stupa are fulfilled. Especially when you see the stupa for the very first time, whatever you pray for, it will succeed. Even from the airplane; the first time you see it, you must do your best prayer. One Brazilian nun, a Kagyu, knew this story. When she saw the stupa for the first time, she made a prayer to be able to build monasteries. When she went back, everything happened. She made plans and was able to build. There are other stories like this. In the next life, then, the oldest brother became the Dharma king Songtsen Gampo in Tibet; he was the Dharma king who had two princesses who brought the statues of Shakyamuni Buddha – one is now at the Jokhang and the other at the Ramoche. He did great activities to benefit all sentient beings, and I think he also helped to build the Jokhang. The second brother became a minister in Tibet [Padma Gungtsen]. The third brother became an abbot [Shantarakshita], and the fourth brother became Padmasambhava. When they were building the first monastery in central Tibet, Samye, during the day the people would build and then at night spirits would tear it down. One of the ministers suggested that they invite Padmasambhava from India. When he came he manifested as a deity called, I think, “Controlling the Three Realms.” This deity hooked the spirits and subdued them, making them pledge to become Dharma protectors. So they stayed around him on the mountain to protect the Dharma in Tibet. Therefore, Mahayana Buddhism in Tibet has spread and been preserved for many years, and so many beings have actualized the path and become enlightened. And because of this, Tibetan Mahayana Buddhism has spread all over the world. Even in the West, many tens of thousands of people every year are able to follow the path to enlightenment, make their lives meaningful, and find peace and happiness. Including us: we have the chance to practice the lam-rim and are able to do purification every day, thus becoming closer and closer to liberation from samsara and enlightenment by collecting the three principal aspects of the path to enlightenment and, on top of that, the tantric stages to allow us to achieve enlightenment quickly. All these opportunities that we and many others have in our everyday life, all this benefit, has come from Bouddha Stupa. From Benefits and Practices Related to Statues and Stupas, available through the FPMT Foundation Store.